Intensifying their search operation, US and Italian commandos have launched an all-out hunt for Osama bin Laden and Taliban supremo Mulla Muhammad Omar along the Pakistan-Afghan borders. “Commandos have launched a systematic hunt to capture bin Laden, Omar and an Afgan rebel leader Gulbuddin Hekmatyar dead or alive,” officials said. Nearly 1,000 US war veterans have signed a letter sent to President George W. Bush, questioning the wisdom of another war in Iraq and requesting a meeting to express their concerns. US President George W. Bush has signed a decree establishing medals to reward front-line soldiers in the war on terrorism launched after the September 11, 2001, attacks. The USA has ordered 103 Pakistanis to leave the country for committing immigration violations and criminal offences. The Pakistanis to be deported included the immigration violators as well as those arrested on various criminal charges, US officials were quoted as saying by Pakistani daily Dawn today. China today began naming a new generation of leaders to head the government for the next five years with the appointment of Mr Jia Qinglin as the Chairman of CPCCC National Committee, the country’s top advisory body. The government and Maoist rebels have agreed on a protocol for peace talks to end the bloody seven-year Communist insurgency, Nepalese newspapers reported today. In celebration of the golden jubilee of the first summit of Mount Everest, Nepal will issue free life-long visas to all foreigners who climbed the mountain, a media report said today. The USA has provided over £ 1 million in emergency relief assistance to drought-affected Rajasthan in the fiscal year 2003. Sindhi women from all over the world expressed their views on the existing gender inequality on International Women's Day at an event held in Washington. Intensifying their search operation, US and Italian commandos have launched an all-out hunt for Osama bin Laden and Taliban supremo Mulla Muhammad Omar along the Pakistan-Afghan borders. “Commandos have launched a systematic hunt to capture bin Laden, Omar and an Afgan rebel leader Gulbuddin Hekmatyar dead or alive,” officials said. The officials claimed that the FBI and military officials have been combing the area for the wanted men, though ISI has denied any intensive operation on the Pak-Afghan border. The Italian Alpine commandos have been operating in south-east Afghanistan near Baluchistan border for about a week in the volatile area. The officials said the Americans were convinced that Bin Laden and others were changing places almost daily moving along the borders and there was a strong chance that one of them might be captured dead or alive in the next few days. They said the Alpine commandos, who were in action along the border with Pakistan since December 2002, appear Pashtuns, wear salwar kameez and sometimes even turbans and shawls. The commandos study roads and mountain passes, inspect caves and tunnels and mix up with villagers. They carry computers to transmit reports to the US Air Force base in Bagram. “We may hear some news soon,” the officials said. Rejecting reported claims by its officials that Osama bin Laden was “hours and days away” from being captured, Pakistan’s ISI has said the terrorist mastermind was not in the country. “It is question of common sense. If any intelligence agency would get a clue of this nature, why would it leak this information to anyone. It could be counter-productive,” an unidentified “top ISI” official told local media yesterday when asked about ISI’s claims, reported by western media. He said according to the best assessment of the ISI, Bin Laden was not on Pakistani soil. However, Pakistani intelligence agencies would always promptly react to any lead received from international intelligence networks, he said. “We feel duty-bound to share with you our serious concerns regarding issues of national security, the appropriate use of our military strength, and the health and welfare of our active-duty soldiers, sailors, airmen and marines,” said the letter sent yesterday from the newly formed group Veterans for Common Sense. 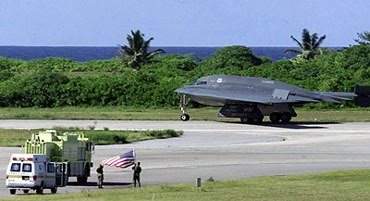 “We understand the risks that come with war and that there are times when such risks are necessary. However, we strongly question the need for a war at this time,” it said. The Global War on Terrorism Expeditionary Medal will go to members of the US armed forces who serve or have served abroad in military operations to battle terrorism, according to a White House statement. The USA has ordered 103 Pakistanis to leave the country for committing immigration violations and criminal offences. The Pakistanis to be deported included the immigration violators as well as those arrested on various criminal charges, US officials were quoted as saying by Pakistani daily Dawn today. The majority of the deportees stayed in the USA without valid visa or work permit, but there are also others who were arrested for possessing drugs, soliciting prostitutes and other similar offences, they said. The deportees will be sent to Pakistan by a chartered flight, the officials said. Since the September 11, 2001, terrorist attacks, hundreds of Pakistanis have been deported, initially on commercial flights, but later the US Immigration and Naturalisation Service (INS) decided to charter planes for deportation when commercial airlines refused to carry them due to security threat to other passengers, the daily said. Mr Jia, member of the standing committee of the politburo of the ruling Communist Party of China (CPC) Central Committee, was elected to the post at the fourth plenary meeting of the body’s first session, attended by 2,151 members, the official Xinhua news agency reported. 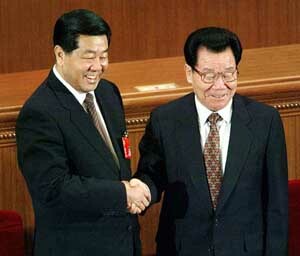 Jia, 62, replaced Li Ruihuan, 67. “Mr Jia’s appointment comes as no surprise as it was known last November that he would be the head of the CPCCC,” an Asian diplomat commented, adding that the CPC would like to go strictly according to the wishes of the top leadership so as to ensure continuity and political stability. Mr Jia, the former Communist Party secretary of Beijing is considered a close aide of the outgoing Chinese President Jiang Zemin. He and other close friends of Mr Jiang are expected to help Mr Jiang maintain political power behind the scene after he relinquishes presidency on Saturday. Mr Jiang is expected to be succeeded by his deputy Hu Jintao, who was made the general secretary of the CPC in November last year. 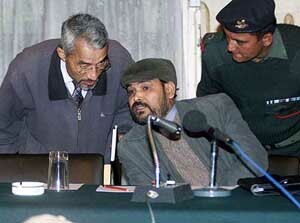 The agreed upon formula for peace negotiations sets forth a basic code of conduct for both government officials and Maoist rebel representatives, before and during talks. With the protocol in place, peace talks are imminent, sources said. The Nepali-language daily Kantipur, quoting a high-level Maoist source, said both sides agreed to stop military offensives against each other, and also refrain from brandishing weapons, which could create “terror” among the public. Both sides agreed to release detainees from custody in a gradual process. The release of detainees was one of three contentious issues that delayed an agreement on the code of conduct. The Maoists demanded immediate release of their captured cadres, while the government declined, citing its experience in 2001 when the government faced difficulties re-arresting Maoists released during peace talks later aborted. The government and the Maoists held talks in 2001 but the Maoists walked out, and resumed violent attacks on government offices and army and police barracks. According to the code of conduct agreed on Wednesday, there will be a volunteer monitoring committee to ensure that both sides adhere to the protocol. Such a team would be constituted through mutual agreement. Both the sides agreed not to include representatives from international human rights groups on the monitoring team. The English language daily Kathmandu Post quoting the Ministry of Tourism said the concession to the Everest heroes and heroines could be effective within the week. More than 1,000 persons have made it to the top of the world’s highest mountain from the Nepalese side. Among the 1,048 who have reached the summit of Mt Everest, 8,848 metres (29,029 feet), 600 are foreign nationals. Nepalese account for the largest number of Everest climbers with 448 of them making it to the top. The government is also providing a one-time free visa to 460 persons who will be participating in different programmes related to the golden jubilee celebrations. The US Agency for International Development (USAID) and the Office of US Foreign Disaster Assistance (OFDA) provided emergency assistance of £ 1,072,966 to mitigate the effects of drought which affected nearly 43 million people in Rajasthan, a USAID statement said here. 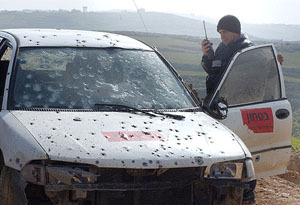 A policeman looks at a car in which two Israeli armed guards were killed by Israeli soldiers in a friendly-fire incident near the West-Bank settlement of Pnei Hever on Thursday. Israeli soldiers and a helicopter gunship shot dead two Israeli armed guards in the West Bank on Thursday after mistaking them for Palestinian gunmen, the army said.